The Village of Wales boasts a long and full history. Its name was derived from its first Welsh settlers, the Elias Family and other early farm families, who emigrated from Britain to the area in the 1840. Today, the Village still incorporates its heritage by proudly displaying the Welsh red dragon depicted on the national flag of Wales, England. In 1880, the arrival of the Chicago Northwestern railroad and the erection of a train station brought increased activity to Wales. These were driving factors in the Village establishment in 1882. In 1895, the Elias family built their distinctive new home on Main Street, which still stands majestically in their original Victorian style in downtown Wales. The Elias family home later became residence to the George Webb family, the business entrepreneurs and creators of the well known George Webb casual restaurant chain. 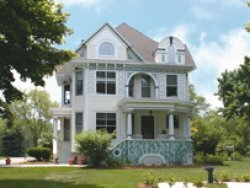 Now known as Pedal’rs Inn, the home continues to provide the century-old tradition of hospitality as a bed and breakfast for local visitors. Commerce began early in Wales when the James General Store opened its doors in 1882 on the corner of Main and Elias Streets and began providing the community with food and dry goods. Businesses continued to burgeon in the area and soon included a shoemaker, blacksmith, hardware shop and meat market. Today, the Village area continues to grow and develop. New and emerging businesses, an increasing residential population and developmental improvements all continue to carry the legacy of a flourishing community, making Wales a desirable place to visit, reside or own a business.